Phillip Timper decided to become an artist very early in life. A Midwestern boy, he started landscape painting at age 9, lived in the art room during high school, and painted his way through college. He moved into a design and illustration career as an adult. However, his love of art and painting persisted and he continued to paint and make art to this day. 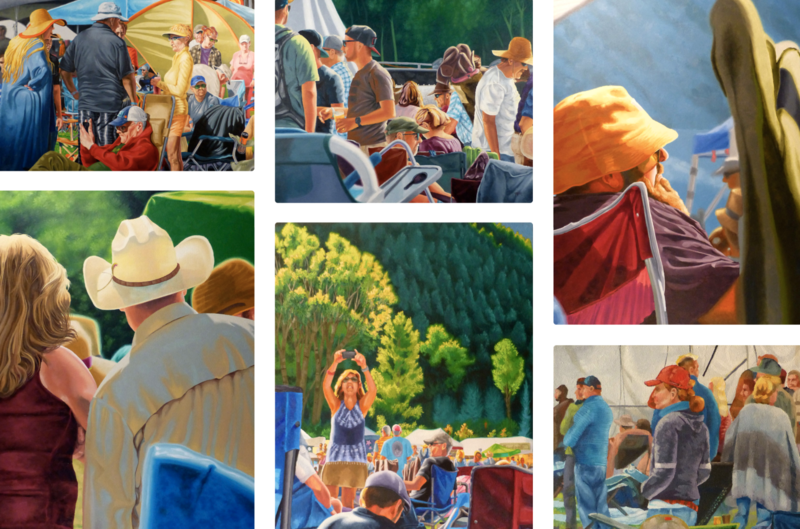 he April Art Wall Opening Reception on Sunday, April 7, 2019 from 12:00 pm to 1:30 pm will showcase works depicting themes of exhilarating colors and familiar images to Timper, a prolific oil painter, and muralist from Prescott, Arizona. Timper chooses oil paint, watercolor and pencil as his choice of media to reflect the world around him, focusing on capturing images to explore subjects of quiet moments filled charged emotional moments of everyday life. Although the perspective in the matter changes from work to work, Timper presents an unforgettable array of colors that tie these themes together at this exhibit. "Think of painting as you might think of language. There are thousands of languages spoken today all with the same purpose, communication,” Timper said. Timper’s current works depict his gritty devotion to capture his fellow humanoids in natural habitats that can be observed in the Blues n Brews Festival Series, The Abstraction Series, and the Desert Animal Gift Collection. The opening reception will be from 12 noon to 1:30 pm in Forbes Hall, April 4, after the Sunday morning services. The exhibit will go through the end of April. For appointments, contact Cyndee Hayes at assistant@uusm.org or 310-829-5436 x102. Accessible parking is available behind the church. About UUSM: The Unitarian Universalist Community Church of Santa Monica (UUSM) is is part of a religious movement committed to Seven Principles that include the worth of each person, the need for justice and compassion, and the right to choose one’s own beliefs. Our congregation and faith community promotes these principles through regular worship, learning and personal growth, sharedconnection and care, social justice action and service, celebration of life’s transitions, and much more. The mission of UUSM is to build a congregational home that supports our vision, that provides opportunities for spiritual and personal growth in an interactive and intergenerational community, that is welcoming and inclusive and that assumes an active responsibility for our community and world. - Ratified by congregational vote, May 20, 2001.